When it comes to K-12 education policy, Hillary Clinton is campaigning on platitudes, and a favorite topic for the presumptive Democratic presidential nominee is teacher compensation. Clinton has proclaimed on several occasions that teacher pay should be raised. The talking point makes her popular with teachers unions, but it’s misleading. Across-the-board base salary pay raises for teachers are not financially feasible for most school districts, nor is the idea considered strategic policy. Low and stagnant teacher pay is alarming, but simply — and hastily — raising teacher salaries across the board will not solve the problem. Instead, districts should use teacher compensation as a lever to attract, retain, and support a high-performing teaching force, and they need to do this in a financially sustainable way. Base salary increases may be part of the solution, but districts also need to consider other key components of teacher compensation including teacher effectiveness, the speed of salary growth, bonuses and rewards, incentives for hard-to-staff schools and positions, and so on. The balancing act isn’t easy. The best solution is to use data to make decisions about teacher compensation — a practice most school districts do not employ. 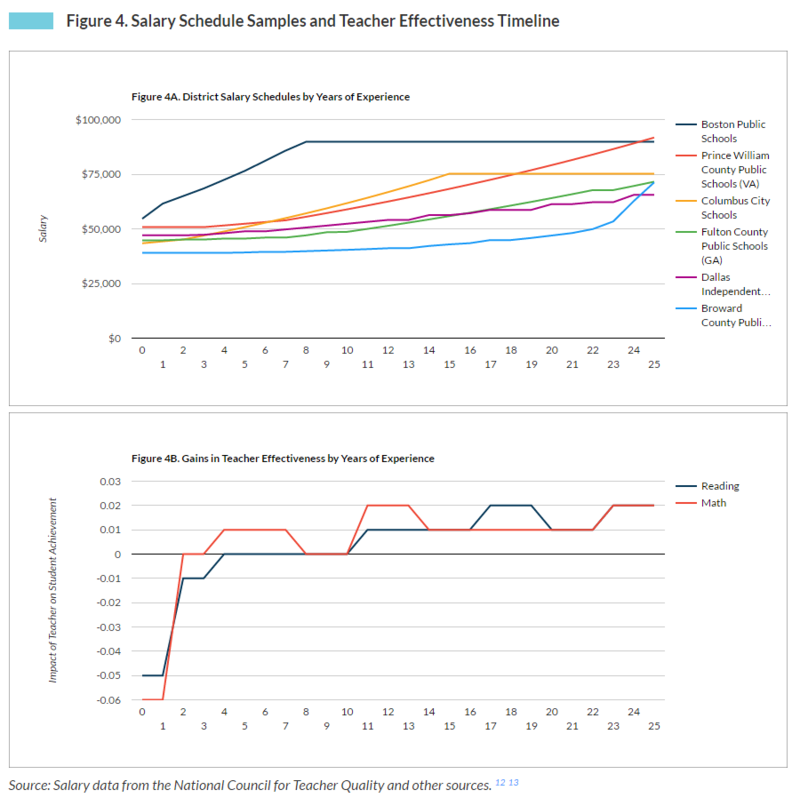 As a new Bellwether Education Partners resource called The Learning Landscape explains, the structure of most teacher salary schedules does not align with the evidence of teacher performance. For example, research shows that teachers improve greatly in their first few years of teaching and then their performance levels off, however very few districts use this data to make decisions about teacher compensation to retain top-performing new teachers. As the above charts shows, while teachers on average rapidly grow in their effectiveness in the first five years of teaching, they do not see substantial pay raises until about one decade into their careers. To retain effective new teachers, a district might consider increasing how quickly those teachers receive large pay raises. A district might not have the funds to use this data-driven compensation strategy if it raised all teachers’ salaries. This is not to mention other data-driven and research-based teacher compensation strategies such as raising teachers’ compensation as they take on leadership roles within their school communities. Most districts have a long way before they implement these kinds of strategic compensation designs. The vast majority of school districts implement a compensation structure that treats all teachers the same, regardless of performance, skill, or responsibility. In fact, as The Learning Landscape details, in 2012 only 11 percent of districts used pay incentives to reward teachers for excellent performance. However, if districts follow Hillary Clinton’s suggestion to raise all teachers’ salaries, data-driven teacher compensation strategies of any kind will not be possible in most places. Perhaps Clinton has something more strategic in mind when she talks about teacher pay, but voters will not know if she continues to speak in generalities when it comes to issues of K-12 education. This entry was posted in Education Policy, Politics of Education, Research, Teacher Effectiveness and tagged Teacher Evaluation on July 25, 2016 by Kaitlin Pennington.